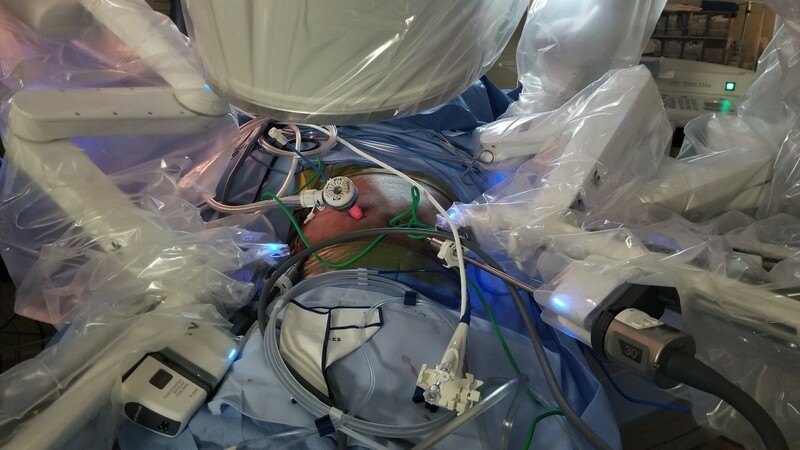 A first of its kind procedure at William Beaumont Army Medical Center may make it possible for some patients to minimize operations when dealing with Common Bile Duct (CBD) exploration, thanks to an innovative surgical team employing a recently approved Food and Drug Administration device to CBD exploration. The device, an advanced digital endoscope which allows for three-dimensional visualization, was paired with a robotic-assisted minimally invasive surgical system to conduct the procedure, a first in medicine, according to the device manufacturer. This eliminated the need for multiple surgeries for a patient who had previously undergone gastric bypass surgery. During a regular checkup, 52-year-old Milton Johnson discovered his bilirubin test were elevated, an indication of conditions such as jaundice, anemia or liver disease. After undergoing an ultrasound and an MRI, Johnson discovered his CBD was dilated and a polyp on his gallbladder which would need to be removed. "(Johnson) had a gastric bypass several years ago, now presented with blockage of the CBD," said Lt. Col. Eric Ahnfeldt, General Surgery Residency Program director and chief of Bariatric Surgery. "Usually that is evaluated with a scope (through) the stomach which then enters the intestines. Because he had a gastric bypass, that route was not available." According to Ahnfeldt, a stricture (blockage) of the CBD, the small tube in the gastrointestinal tract connecting the liver, gallbladder and pancreas to the small intestine, could possibly signify cancer or choledocholithiasis, a condition where gallstones obstruct the CBD. Normally, CBD exploration is performed by a gastroenterologist trained in a procedure known as endoscopic retrograde cholangiopancreatography (ERCP), which routes an endoscope through the digestive tract leading to the CBD. Johnson's gastric bypass made normal ERCP procedures difficult due to the restructured anatomy. While other options exist for patients seeking CBD exploration with a gastric bypass, a multidisciplinary team of specially-trained physicians would be required to complete such an operation. 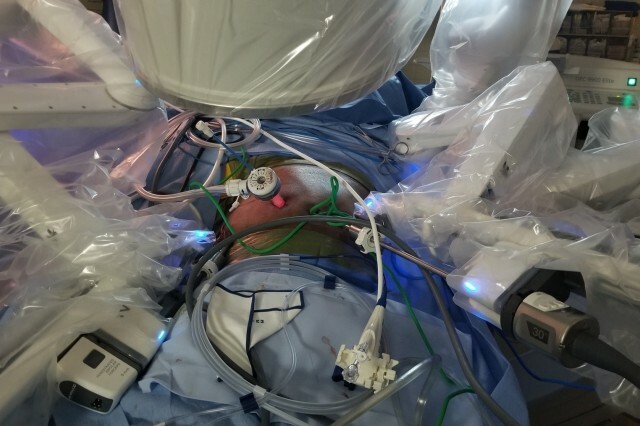 Due to limited resources, WBAMC surgeons opted to use the device, already designed to explore the CBD, along with the robotic-assisted minimally invasive surgical system, to gain access to Johnson's CBD, without having to coordinate efforts with the multiple specialists traditionally required. "You can do (ERCP), with patients who have had gastric bypass by doing a laparoscopy-assisted surgery, (but we had) a dilemma. (WBAMC) has no ERCP-trained physicians, but we do have (laparoscopy) physicians," said Ahnfeldt. "To perform the procedure you need very stable hands, there are a lot of structures we are dealing with which can cause a lot of damage. So we elected to use robotic-assisted technology, a very stable platform." In one operation, the surgical team paired the advanced digital endoscope with the robotic surgical system, along with a fluorescent dye specially designed for use with the robotic surgical system, to perform the exploration while removing Johnson's gallbladder. "We made four small incisions to take out the gallbladder, identify any areas of concern, and make a small incision on the cystic duct to pass the (advanced digital device) into the common bile duct," said Ahnfeldt, who led the pioneering procedure. The device, with a diameter slightly larger than three millimeters, made it possible to travel to the CBD and visualize the stricture in three dimensions, something not possible through traditional procedures which may only produce two-dimensional imagery. Furthermore, the one-time use device minimizes the risk of infection due to poorly sterilized tools, improving patient safety during the procedure. "This is a real game changer for general surgeons across the country," said Ahnfeldt. "For general surgeons to be able to rely on this technology is really going to change how the algorithm works for patients with choledocholithiasis." For Johnson, a retired Army first sergeant who now teaches in El Paso, Texas, a biopsy taken through the innovative procedure proved the stricture was benign. Using the same device, surgeons were able to deploy a balloon catheter in the CBD to reopen the CBD. "(The procedure) simplified the healing process for me and was one shot," said Johnson. "Now I'm back to work and that's huge for me." "The application of this will extend beyond just this particular operation which was a benign stricture of the common bile duct, to patients that come in with stones in their CBD that need gallbladder removed," said Ahnfeldt. "(WBAMC) is no longer reliant on (an ERCP-trained) gastroenterologist. Just within the surgical department we can manage this whole entire process. "It's better for the patient because they only get one anesthetic, surgeons themselves are able to take care of the problem right then and there, and it gives you more information through visualization," added Ahnfeldt. Johnson credits the surgical team with keeping him informed and at ease about the new procedure throughout the process, while also relieving the stress on his family through open communication. "The medical team here went the extra mile," said Johnson. "It's a great team here, the bariatric team has been wonderful, all of them." "It was exciting to use that technology to help one of our beneficiaries," said Ahnfeldt. "To be able to be the first ever to perform that procedure with a robot really speaks to the quality of care at WBAMC and the quality of care we provide our beneficiaries. I was honored to be a part of that."